Mayfield Snow Cream has kids asking for more. There's no doubt about it. My kids hope for the homemade version every time the white stuff starts falling. (Ok, make that kids and adults.) Even though our area has had lots of snow this year we've not had enough to make snow cream. Making a bowl of this wintry goodness isn't difficult. Just take the biggest mixing bowl that you have and fill it to the brim with snow. Then add a little vanilla, some regular or evaporated milk and sugar. Stir it up until it's about the consistency of soft ice cream. In a couple of minutes you are ready serve. The only problem is that you absolutely must have snow to make this dish. Now, there is an easier way to enjoy this winter treat. 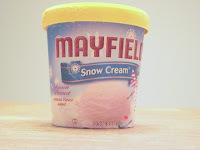 We were introduced to Mayfield Snow Cream ice cream at one of the free Knoxville Christmas events a few years ago. I had forgotten about the product until my daughter picked up a pint at Food City ($1.99). The Mayfield Snow Cream isn't like regular ice cream.The texture is more of a sorbet where regular ice cream is heavier and creamier. It has the consistency that the homemade treat is supposed to have. The flavor tastes exactly like my mom use to make. How Mayfield Dairy managed to recreate and package this recipe is a guess that anyone can make. One taste and you'll be transported back to the days of your childhood. My kids will still hope for that snowfall when we can make it ourselves. The bonding that comes from being together to do something fun is one thing that can't be packaged. For all the days that there isn't enough snow there's the down home goodness of Mayfield Snow Cream. There is one way that this company provides for family bonding. Mayfield Dairy Farm is just down the road in Athens, TN. This is a fun family activity that everyone can enjoy. More about the dairy and free tours is available by clicking through this link. Be forewarned. If you decide to visit the farm in warm weather you shouldn't expect to try this product. 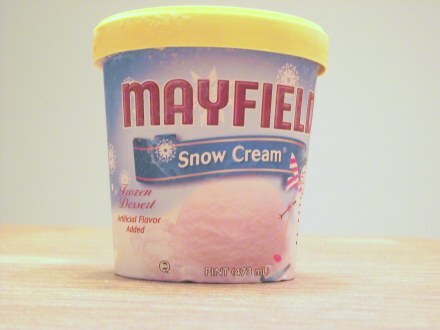 Like the snowflakes that fall from the sky, Mayfield Snow Cream is only around in cold weather.